Older and Wilder is a social group of older lesbian and bisexual women who live, work or socialise in the Bradford district. 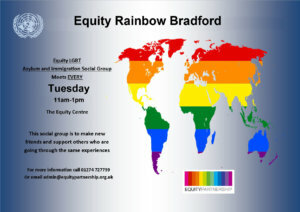 We meet every fortnight in an exclusive social space at the Equity Centre in Bradford on a Wednesday afternoon from 1pm to 3pm. Members each bring a small amount of food and we share a meal together.